Above: From the National War Tax Resistance Coordination Committee, nwtrcc.org. The inauguration of Donald Trump has been met with some of the largest street protests in U.S. history. The executive order to close immigration to refugees and travelers from particular countries brought out more days of protest. Social media has been alive with calls to openly defy the Internal Revenue Service and redirect income tax dollars to those groups harmed by Trump administration policies. Many protesters are asking themselves how can they write checks for policies that they find abhorrent. With the tax filing deadline of April 18 approaching, deliberate refusal to pay taxes may become a significant tactic to supplement the public protests, which show no signs of abating. · Six weeks before Trump became president, Sicangu Lakota spiritual leader Leonard Crow Dog spoke at Standing Rock, urging people to not pay taxes if the U.S. government does not honor its treaties with Native American tribes. · On December 9, 2016, feminist leader Gloria Steinem talked about giving some of her taxes to Planned Parenthood instead of the IRS, in defense of women’s healthcare. Other campaigners are calling on taxpayers to redirect their taxes to sanctuary cities if federal funding is cut off as Trump has threatened. · Riding the tide of the current popularity of George Orwell’s dystopian novel Nineteen Eighty-Four, longtime war tax resister Ed Hedemann has proposed that new resisters reduce their payments to the IRS by $19.84, or $198.40, or $1984. · Others say they won’t pay their taxes until Trump releases his tax forms. Tax refusal has a long history in the U.S., from the Boston Tea Party, to Thoreau’s refusal of the poll tax collected for the Mexican-American War, to widely practiced tax resistance during the Vietnam War. Refusal to pay taxes for war has been continually practiced since World War II, at times by only small groups of pacifists; at other times, such as before and since the invasion of Iraq, by thousands opposed to war. Today the National War Tax Resistance Coordinating Committee (NWTRCC) calls on U.S. taxpayers to reinvigorate this form of resistance in order to challenge federal policies, spending priorities, and actions. We oppose Trump administration plans to boost the Pentagon budget and cut social spending. In addition, the Department of Homeland Security (border and immigration control, and the 1033 program that sends military weapons to local police forces) and the Energy Department (nuclear weapons), among other agencies, are major parts of the military budget. NWTRCC provides information and support to all people of conscience who openly refuse payment of some or all of their federal income taxes to the IRS and instead send refused taxes to groups targeted by Trump administration policies. Prior to the inauguration, NWTRCC had already called on affiliate groups to participate in a “collective redirection” of resisted taxes to organizing led by people of color. In addition, many may choose to redirect their taxes to groups like Black Lives Matter, indigenous rights organizations, homeless shelters, refugee aid groups, threatened health clinics, immigrant sanctuaries, climate change and environmental activists, and peace and antiwar organizations. War tax resisters use various methods to practice this act of civil disobedience. Some live on incomes below the taxable level, some refuse to pay part of the taxes due, others refuse 100% of tax money owed to the IRS. The website nwtrcc.orgis a resource for information about how to resist and potential consequences from IRS enforcement, as well as how to connect with groups around the country. “By redirecting our taxes from the IRS to groups in need, we are divesting from war and investing in people, we are saying ‘NO!’ to the militarization of the U.S. federal budget — the wars and occupations, the militarized border and local police forces, and the inevitable crackdown on civil rights,” says NWTRCC organizer and longtime war tax resister Erica Weiland of Seattle, Washington. The National War Tax Resistance Coordinating Committee (NWTRCC) is a coalition of local, regional and national groups providing information and support to people who are conscientious objectors to paying taxes for war. NWTRCC was formed in 1982 to oppose the buildup of the U.S. military under the Reagan administration. Will I go to jail if I refuse to pay war taxes? Protesting cuts to social spending? Over twenty years after we ended actual welfare aid, I assume this refers to anything other than poverty relief. When Congress virtually ended food stamps to the elderly and disabled in 2015 (cut from $115 per month, to $10), public indifference was expected. While the overall life expectancy of the US poor has fallen below that of every developed nation, Americans shrug. I’ve wondered how liberal media pick and choose the issues on which they “rally the troops.” Their choices can be difficult to understand. They called gay marriage a “human right” while saying little about the fact that the US stripped its poorest of the most basic human rights (UN’s UDHR) of food and shelter. They’ve driven away the masses of poor, and most recently, have focused on stressing just how much contempt people of color have for white people. Are you sure this is the best way to build a movement? It’s a stretch to call today’s wide range of unrelated protests a “movement.” Those who point out how and why we’re so divided tend to be criticized for being divisive! So are we supposed to just ignore reality? Could be. This is pretty much how the era of protest and progress pf the 1960s was ended. It is time to be creative and use every legal tax break that you can. Just so you know, as soon as the IRS puts a lien on your property, i.e., home, car, real estate, etc., your credit is screwed! You won’t qualify for enough credit to buy a pack of gum. Don’t listen to these fools! What person in their right mind wants to live on credit, as a debtor to the banks? That’s the modern version of slavery. These “fools” include Henry David Thoreau and thousands of the most notable and moral Americans throughout history. So you’re suggesting everyone simply emulate the corrupt and self-serving Trump. The media don’t made the decisions about “rallying the troops” – they merely report on what the grassroots movements choose to do. The rest of your tirade is similarly ignorant and ideologically-blindered drivel. Interest in conscientious tax resistance also increased dramatically when Reagan was elected, and Reagan now seems moderate compared to the bomb-throwing, establishment-hating Trump, who was selected more by Putin than by the American people (the overwhelming majority of whom rejected his candidacy). You do not see the US media as very pro-war? They rally the country for almost every war. That is not done very often according the War Tax Resistance League who has handled many cases for many years. See http://nwtrcc.org/ if you have questions. There is no “war tax resistance league”. 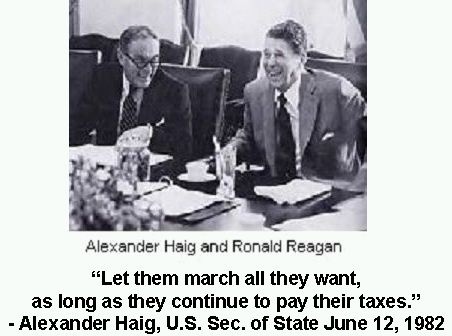 There is the War Resisters League, founded in 1923, and the War Tax Resistance Coordinating Committee, founded in 1982. There is also the Peacemakers, the nation’s first militant secular war-tax resistance group, founded in 1948 (I knew several of the founders). You have been consistently responding to nothing I have stated here, and creating Straw Man arguments which are not in any way based on my actual words. Open your mind to mass resistance. We are talking millions. And, We as a People of human nature, may well be willing to walk a different path rather than stand aside for what is to come. This is War. We are in it, or We are with Them. how is using tax resistance to retain the humanitarian country that we have established, emulating corruption and self service? Explicitly? To which fictional “humanitarian country” are you referring? What part of exploiting the system of tax avoidance used routinely by the wealthy do you find uplifting? It’s a form of resistance for good. Maybe the only one that could help if the system were challenged so deeply. It’s not about getting away with something. It’s more like a boycott. Civil disobedience is “resistance for good” (if it’s for good reason), but NOT simply tax avoidance, which is what Curtis Bell advocated and what my comments are in reference to. I have been publicly refusing to pay ANY federal income tax (and keeping my income low) for 37 years. Gaming a fundamentally corrupt tax system – no matter the rationalization – is NOT the same as war-tax resistance. Anyway, I am just asking the question. To let it take on it’s own life. Does Trump and his tribe think that if he does not take his presidential salary of $500k a year that he can continue not paying taxes?